Welcome back to Mini of the Week, where every Friday (but Saturday this time due to travel) I will find a miniature from around the web that exemplifies an aspect of our hobby and share it with you. I really love the overall palette of this model. Everything is either very warm, or it's blue, which even has a hint of warmth in it with the color used for the highlights. 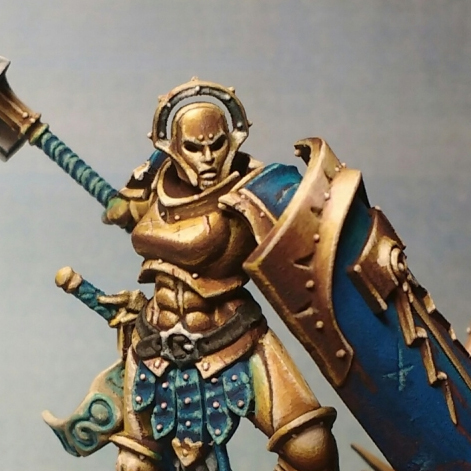 Sometimes I think non-metallic metals can look cheesy, like the painter is trying to show off, but here I really like them. They're done with just the right amount of contrast. It's not pushed too far where it looks like they're just showing off. There is even a bit of reflection worked in on her legs where the blue of the leather is showing on the gold. The base is super nice too. It's different enough in color that it stands apart from the model, but close enough in tone that it still works as a whole. There's a very painterly quality to this model that I'm really responding too as well. It's still fairly smooth and well blended, but you can still see the hand of the artist in it as well, which I really like. It almost looks like it was cut out of a larger painting. Projects like this, where the palette is very limited always stand out to me since then it really shows off the skill of the artist and how they're able to make the most out of their limited choices. 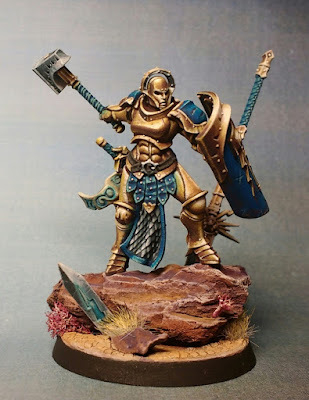 I would love to see more Stormcast in this style.